WINNER OF THE SUNDAY TIMES / PFD YOUNG WRITER OF THE YEARSHORTLISTED FOR THE DYLAN THOMAS PRIZE 2018SHORTLISTED FOR THE KERRY GROUP IRISH NOVEL OF THE YEAR 2018SHORTLISTED FOR THE RATHBONES FOLIO PRIZE 2018LONGLISTED FOR THE DESMOND ELLIOTT PRIZE 2018A SUNDAY TIMES, OBSERVER AND TELEGRAPH BOOK OF THE YEARFrances is twenty-one years old, cool-headed and darkly observant. A college student in Dublin and aspiring writer, she works at a literary agency by day. At night, she performs spoken word with her best friend Bobbi, who used to be her girlfriend. When they are profiled by Melissa, a well-known journalist, they enter an exotic orbit of beautiful houses, raucous dinner parties and holidays in Provence.Initially unimpressed, Frances finds herself embroiled in a risky ménage a quatre when she begins an affair with Nick, Melissa's actor husband. Desperate to reconcile herself to the desires and vulnerabilities of her body, Frances's intellectual certainties begin to yield to something new - a painful and disorienting way of living from moment to moment. 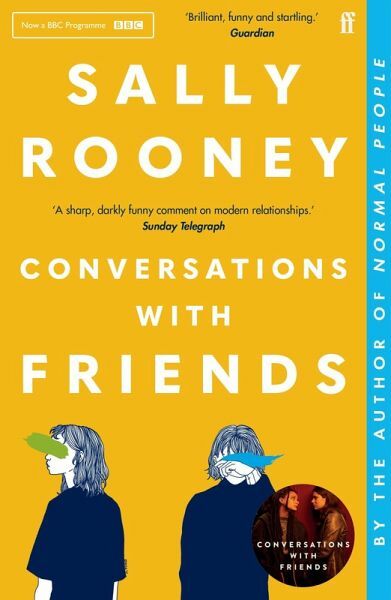 But as Frances tries to keep control, her relationships increasingly unspool: with Nick, with her difficult and unhappy father, and finally even with Bobbi.Written with rare precision and probing intelligence, Conversations with Friends is exquisitely alive to the pleasures and inhibitions of youth.